The postseason all-star games in college football are all wrapped up. The Scouting Combine has come and gone. Pro days are underway (which I’m not sure anyone has ever not impressed in a pro day). We have got a clearer picture of where some guys are slotted to go come draft weekend. 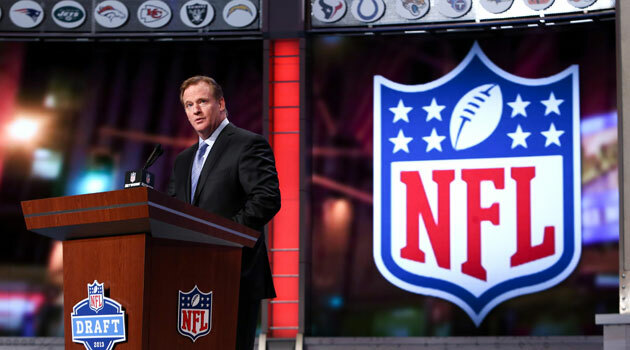 Who will get their named called by Commissioner Roger Goodell just just two months from today? Discuss your thoughts on these mocks over on our message board. The Ravens have some needs of course and draft day is like Christmas to them. Here’s a couple early, pre-free agency mock drafts of who I think the Ravens could take based on two scenarios. They don’t trade any picks, or they trade back in the draft to acquire more picks later on. If the Ravens make no changes to their draft board, they will have a first, second, third, and sixth round pick. Their fourth and fifth round selections we’re traded to Jacksonville to acquire Eugene Monroe. Their seventh round pick was traded to Indianapolis to acquire A.Q. Shipley. It’s expected that the Ravens could earn at least three more compensatory picks for losing free agents Dannell Ellerbe, Paul Kruger, and Cary Williams. I’m estimating a fourth, fifth and sixth round selection for those three men. If they are lucky, maybe the Ravens get a seventh round compensatory pick for Ed Reed, but I doubt it. Later on in the month of March we should find out exactly what compensatory picks the Ravens will have. Zack Martin, 6’4” 308 lbs. Martin is the fourth ranked OT in this class. Greg Robinson (Auburn) and Jake Matthews (Texas A&M) figure to be top ten picks, with Taylor Lewan (Michigan) not far behind. Right now, I don’t see Lewan falling to #17, and trading up isn’t the Ravens style. It’s a deep draft class so trading up may not be necessary. Rob Rang of CBS Sports compares Martin to Logan Mankins of the Patriots. He stays low to the ground to handle speed and power rushes, and has great lateral agility. He shows great athleticism when it comes to blocking on the move when getting up to the second level. Martin plays with a nasty streak. He plays tackle, but because of his size, scouts think he’ll make the move to guard at the pro level, much like Marshal Yanda has. Yanda and Kelechi Osemele are both free agents to be in 2016, so a move like this would be planning ahead for possibly moving Martin to the inside. The offensive line was the beginning of the end for last year’s offense. Martin is a guy who can make them better, and his athleticism suggests a fit for the zone blocking scheme. He also gives you versatility to mix and match O-Line personnel as needed. Jordan Matthews, 6’3” 212 lbs. Matthews could be the big, physical receiver Joe Flacco missed with Aquan Boldin no longer in the mix. Matthews shows the ability to make tough catches, including one handed catches. He is a very detailed route runner which is a must for the west coast offense where precision is paramount. At Vanderbilt he lined up in the slot and also split wide out with the ability to make plays anywhere on the field. The only thing dropping him down to the second round is his lack of elite speed. He did run a 4.46 at the combine though. If you watch this video, you’ll see he has no problem outrunning a few DBs en route to the end zone. Matthews is the cousin of the great Jerry Rice. Chris Borland, 5’11” 248 lbs. The only thing holding Borland back from being a much higher pick is his size. He had the shortest arms of any linebacker measured at the combine. Short arms didn’t stop him from being a Big Ten All-Freshman team member, making 48 starts at Wisconsin, and being the Big Ten Defensive Player of the Year in 2013. His intensity is contagious and plays with and endless motor. His high football IQ allows him to consistently dissect the action, rarely getting fooled. He shows impressive pop and determination to get to the ball. This is going to be the steal of the draft in my opinion if he falls to the third round simply because of arm length. Kenny Laddler, 6’1” 207 lbs. Laddler possesses great size for a centerfielder in the NFL defense. He’s played in 50 games in arguably the best conference in NCAA football. He also played strong safety early in his career and shifted to free safety. He had a hand in ten turnovers in his senior year, picking off five balls and forcing five fumbles as a big hitter. The video below shows how quick he closes the window on open receivers. Michael Sam, 6’2” 261 lbs. Let’s face reality. Sam’s draft stock is going to slip. It just is. He didn’t do himself any favors at the combine posting just average to below average numbers. But doesn’t being the SEC defensive player of the year carry some weight? He’s projected to go somewhere in the third to fifth round. That’s a large range. Teams that don’t want to deal with the distraction can point to his poor combine as a reason to not draft him. If there is one team that wouldn’t let the distraction be a problem, that has had many players already come out and say they would welcome Sam, and not afraid to take the value pick at the end of the fifth round with their compensatory pick, it’s the Ravens. Kevin Norwood, 6’2” 198 lbs. Norwood and his family were victims of Hurricane Katrina, growing up in Biloxi, Mississippi. They were left with nothing. He was a freshman in high school when Katrina ravaged his town, left with no food, no water, no electricity. Norwood talked about the experience in USA Today and said that it was something “God wanted me to experience, just to make sure I stay humble and make sure I appreciate everything I have today.” This is the type of story and type of character the Ravens like. Guys that know what it’s like to have been at a low point in life, and had to work hard to get by. That type of work ethic translates to the football field. On the football side, Norwood runs most of his routes from the slot and shows off great hands. His quarterback trusts him a lot. It’s evident in the video that when the play breaks down, Norwood is the first guy McCarron targets. He won’t break many tackles once he makes the catch, but he would be a very reliable third down and red zone option. Should the Ravens trade back out of the first round with the 17th pick, I would estimate that they could get a team’s second and fourth round selections. Maybe for the 17th pick they could get a second and third round pick. A second and a fourth is what they got in return when they traded the 29th pick in the draft to Minnesota in 2012. They can still land what looks to be a great receiving option and bolster their O-Line as well in round two. On top of that the Ravens can add another need in round four. Gabe Jackson, 6’3” 336lbs. Jackson has that great balance of power and agility. He looks like a great fit for zone blocking with great lateral movement. Jackson prides himself on pancaking defenders, but has been known to lose his cool which means his fundamentals will lack, rendering him inconsistent. Jackson being a guard would mean Kelechi Osemele could shift over to tackle which has been an option the Ravens have thought about last offseason when LT was unfulfilled. He projects as a second round talent, despite being durable enough to have started all 52 games of his collegiate career, and earning first team All-SEC honors. If they trade back, the Ravens will likely miss out on one of the top OTs, but Jackson would be ready to start from day one. Jackson would certainly be an upgrade over Shipley should KO either switch to tackle, or his back problems linger throughout his career. C.J. Fiedorowicz, 6’5” 265 lbs. Fiedorowicz wasn’t utilized properly in Iowa’s offense in 2013 which may have hurt his draft stock, despite being a first team All-Big Ten TE. But he appears to have all the tools of a blocking and pass catching TE as evident by the video of him from a 2012 game in Michigan, one of the nation’s top defenses at the time. He put up great numbers at the combine on the bench showing off his strength, and in the cone and 20-yard shuttle drill to show his quickness in small spaces. Fiedorowicz would be the brute run blocker that would be a nice complement to Dennis Pitta. But Fiedorowicz is also pretty sure handed as well. He’s just not very quick or elusive after the catch. The Patriots have said they like this kid, and if anyone knows how to scout TEs, it’s the Patriots. If they like him, that’s good enough for me. Just hope the Ravens beat them to the punch. These mocks focus on a few things. Upgrading the offensive line with guys who fit into Gary Kubiak’s system. Bringing in a couple different dynamic wide receivers in Matthews who is your Boldin type, and Norwood who is your Welker type, just a couple inches taller. But both who fit the disciplines of the west coast passing game. Taking advantage of a few value picks like Borland and Sam. Both of which stocks have dropped for reasons it shouldn’t have. Fiedorowicz is the blocking TE Kubiak caters to and would allow Pitta to run more passing routes. Ozzie wants a “playmaker at free safety” and they can find that in Laddler, who created ten turnovers last year, without paying top dollar for a free agent or spending a first round pick on Clinton-Dix.